In defense of its economic policies, the Obama administration's argument has been that it has saved America from depression. However, there is a counter argument to be made that the Obama administration has actually slowed the recovery, and if the Obama economic team followed different policies, we would be looking at a raging recovery instead of the present “recovery” that is barely limping along and that is close to relapsing into another recession. The first thing to observe is that the only program done in the past two years that might even have had a benefit was the original TARP program instituted by the Bush administration. (Notice the word might, since there are still questions of whether the bailout of the financial system was needed or improperly conducted. It should be noted that even many conservative economists supported the original TARP, but I will leave it to the reader as to whether they feel it was worth the price.) The original TARP goal was to stabilize the financial system and while many economists will argue that the TARP did exactly that, the subsequent policies have done little to aid economy recovery and may have had a negative effect. The auto bailout began a series of policies that involved massive government intervention into the government essentially taking control over key sectors of the economy. The Obama stimulus has proven to be a bust and most economists are recognizing that very little economic activity has been created as a result. We have seen trillions of dollars thrown into the economy and when you add the recent financial and healthcare reform, we have seen trillions of dollars of new debt piled up while many businesses have been hesitant to add jobs due to the increase cost of hiring additional workers. What if the Obama administration did not bail out the auto industry, did not pass a modest healthcare reform and stimulus plan, did not pass the Dodd-Frank financial reform, pledged no cap and trade under the present economic situation and extended the Bush tax cuts? The Obama supporters would say massive depression, but I will make the case that the opposite would have happened. 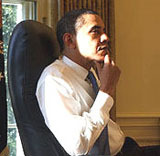 Obama would be in the midst of a roaring recovery and on his way to victory in this congressional election and preparing for his coronation for a second term in 2012. What will be needed to get the economy off is less government spending, revoking much of Obamanomics, before reforming it. The health care bill needs to be reversed before being reformed since we now know that this bill will not only raise health care costs, but it will cost the treasury trillion of dollars; and it won't advance health care in America but set the stage for massive government rationing. The financial reform bill is a 2300 page mess, and no one knows how it will work, including the authors of the bill, Chris Dodd and Barney Frank. Considering they both had a significant hand in the economy collapse to begin with, it is amazing that these were the legislators who designed the bill, and there is no evidence that they learned from their mistakes. Another area that many Obama supporters state is that Obama saved the Auto industry, but all he did was to delay the inevitable. Had GM or Chrysler taken the bankruptcy, both companies would have reorganized and forced to refit themselves to the 21st century market. Instead, they are producing cars that the government wants, including green cars that may not survive in the marketplace, so that we may be witnessing a second bailout down the road. Without Obama’s grand experiment, the economy would have been in better shape and more businesses ready to hire more people with unemployment slipping on a downward slope. Instead, we are seeing higher than needed unemployment with the prospects of slower growth, if not outright contraction. Obama blew the past two years on failed economic theories and after November, he will have two years to turn it around. Bill Clinton saved his Presidency when he rejected the more radical members of his administration, and Obama will have the same opportunity. Clinton was willing to jettison his more radical plans when he came into the White House and moderated his economic plan including reforming welfare plus passing free trade agreements and capital gains tax cuts. Never count out an incumbent President during a re-election season but in this case, for Obama to win; he must reject his own economic plan.